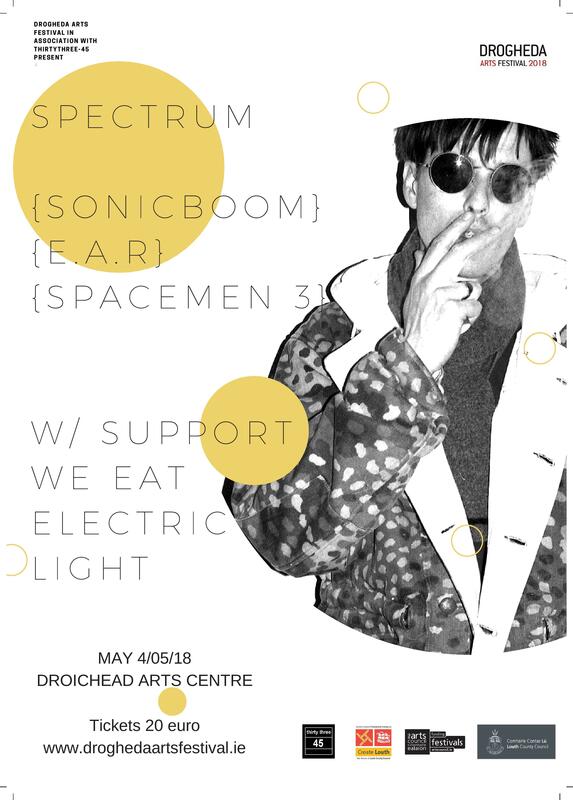 ‘Spectrum’ aka Pete ‘Sonic Boom’ Kember is probarly best known as a founding member of psychedelic hypno-drone pioneers ‘Spacemen 3’. Influenced by bands such as The 13th Floor Elevators, The Stooges, MC5, Suicide and The Velvet Underground they created a trance-like minimilistic psychedelic sound based on the songwriting partnership of Sonic Boom (Pete Kember) and J.Spaceman (Jason Pierce). Recording classic albums such as ‘The Sound of Confusion,‘The Perfect Prescription’ and ‘Playing with Fire’ the band’s legacy and influence is not to be underestimated. The band split in 1991 with Jason forming ‘Spiritualized’ while ‘Sonic’ began recording as ‘Spectrum’ and ‘EAR’ (Experimental Audio Research). ‘Sonic’s’ collaborations include a vast array of musical luminaries such as Silver Apples, Delia Derbyshire, Eddie Prévost, Kevin Shields (MBV), Yo la Tango and Stereolab. Production work includes MGMT and Panda Bear and Wooden Ships. This performance is exclusive to Drogheda and a rare chance to see this legendary sonic pioneer play music from his varying musical explorations taken from a catalogue spanning over 3 decades.